Today I "Hungout" at Rob's place 2,000 km away for a playtest of our Ambush scenario for Huzzah. End Game. The ambushers will retire and the wagons will make it through. Photo by Rob since I couldn't figure out how to do a screen capture on the new version of Google Hangouts. We had a host of unrelated technical problems but we overcame them and managed a good play through and chat. We also tweaked the rules to help them run a little quicker and more decisively in aid of reaching a conclusion within out timeslot. The OB will also be tweaked a little. It had to be tried. The Grand Experiment grinds to a halt as the list of unresolved rules questions begins to grow exponentially. 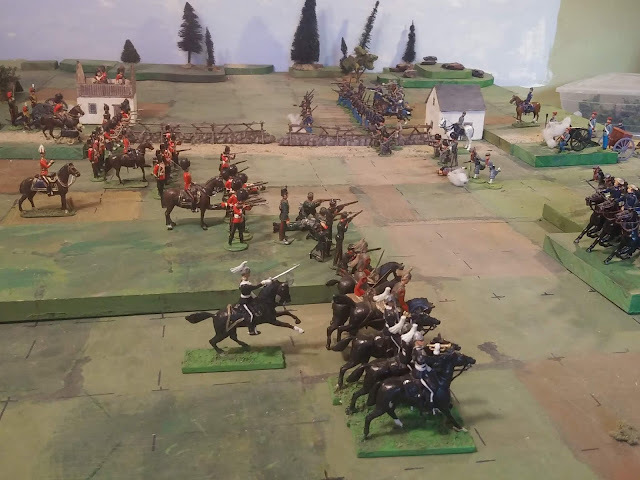 I had previously tried a similar approach using the Square Brigadier but this was going to be less abstract and enable me to fight reasonable recreations of small historical actions like the Battles of Ridgeway and Cut Knife Creek. It took nearly two turns for me to decide that if I added a lot of detail, dealt with all the grey areas and made a bunch of markers to track unit status etc, it might turn into a reasonable wargame. It was never going to be the sort of fast easy game of toy soldiers that I was looking for though. The armies have now been quickly but gently nudged back into their natural units, the rules adjusted and the battle resumed. Without pausing for second thought, I shuffled the units back into their usual 8 figure units (whatever they represent) . This gave each side 3 small Brigades each of 2 battalions, plus a small brigade of 2 cavalry squadrons and a battery. 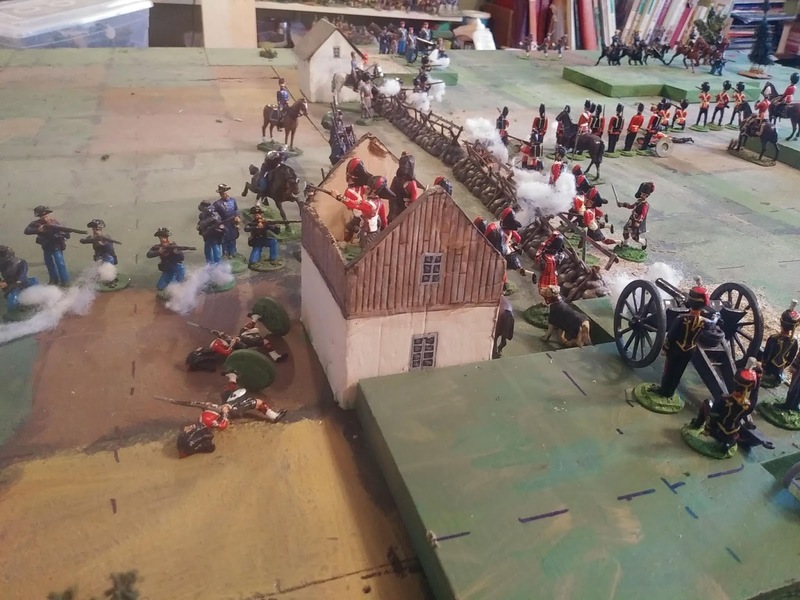 Too big for an historical Fenian Battle but just right for a Toy Solider game. I then quickly implemented the other set of movement and combat rules that I had been planning to use when I set the game out then I continued to play. Fighting rages around North Farm. At this moment, the rules are just a few scribbled notes flushed out by habit but the four page version will be written up in short order and expanded later. What follows is a brief look at some of the mechanics. Basically the game follows an old Don Featherstone sequence from Battles with Model Soldiers with a Card draw each turn (Don used a die roll) to see who goes first that turn. The turn them proceeds as follows: 1st player moves, 2nd player moves, 2nd player shoots, 1st player shoots, resolve charges and melee. One of the reasons I like this because the player going second MIGHT get a double move so the 1st player always has to keep that in mind. It is also balanced with the 2nd player having the advantage of first shot. The battle lines are heavily engaged, The Fort Henry Guard is reserve, the only unit still formed for rapid marching rather than deployed for combat . Melee is the same process but 1d per figure for 5,6 then modified for advantages and disadvantages. General Douglas had to intervene personally to reinforce his order to the cavalry to charge but Col. Denison's reluctance was justified when the attack up the hill into heavy carbine fire was repulsed with losses including the good Colonel himself. Morale is checked if a unit takes shooting casualties of at least 25% of current strength or if it loses a melee or the situation requires it. 4,5,6 OK, 1,2,3 Halt no advance, 0 Retreat full move test to rally next turn. +1 If Elite or in an especially advantageous situation -1 if Militia or in a bad situation (eg flanked, isolated etc) , -1 @25% lost to date. +1 joined by an inspiring commander. 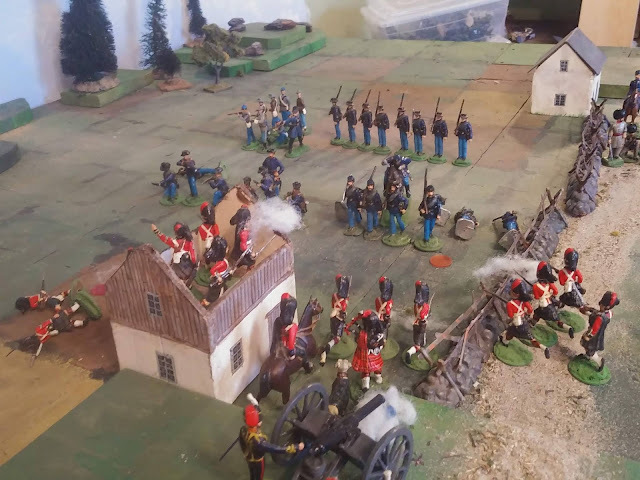 The Rebels are pressing the attack on the Farm. 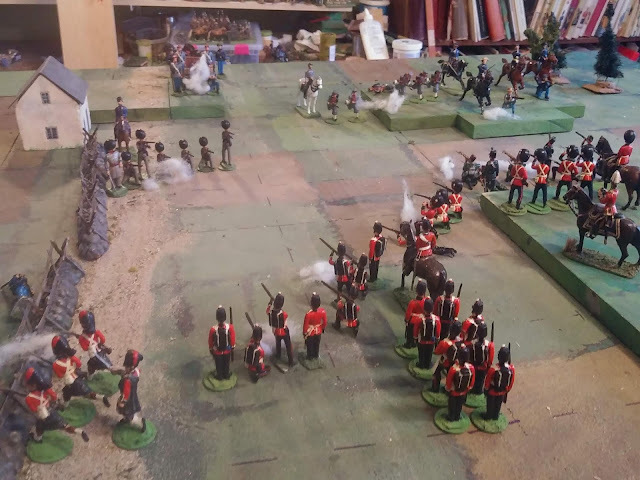 Heavy fire from William's Rebel Brigade which has turned the flank has reduced the 2nd Highlanders to 1/2 strength but these Veterans brace themselves as the enemy closes in. 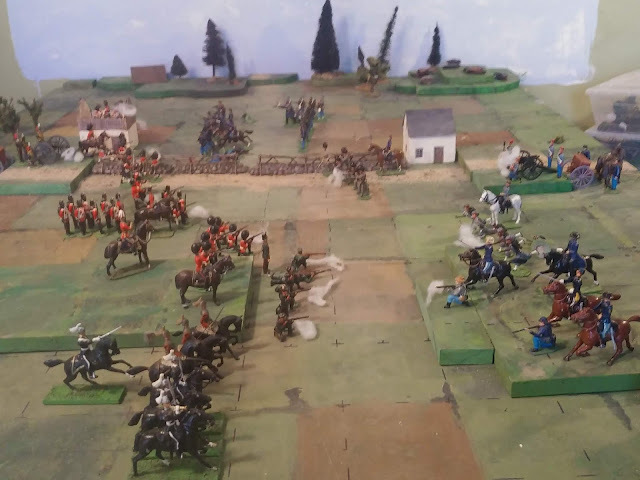 Coming on top of the repulsed cavalry attack it looks bad for the Dominion. Modify for situation and Commander personality. A heavy fire from the Grenadiers has broken the the Elite Zouaves as the cavalry, having rallied, has returned to the charge. Eager to revenge their fallen leader they ride over the Rebel cavalry. On the far flank the rebel 2nd Infantry is shattered by rifle fire from the Highlanders and the 3rd Brigade commander decides that he is not going to sacrifice his men in an assault on that farm.. As the sun sets, neither farm has fallen but the Rebels have lost 4 units out of 9 and are now outflanked and outnumbered. The Dominion has taken some heavy casualties but has not lost a unit. The field is theirs. I'm already looking forward to the next game. 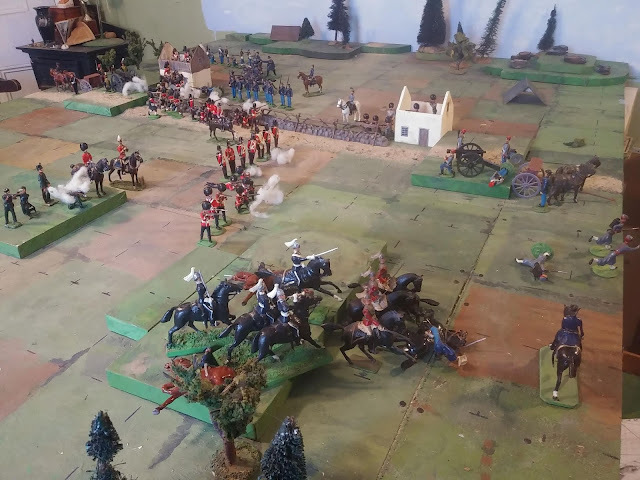 That this video was one of the musical selections played in the background might or might not have affected my Redcoats' performance in battle. I should really paint up a small band for each side shouldn't I? 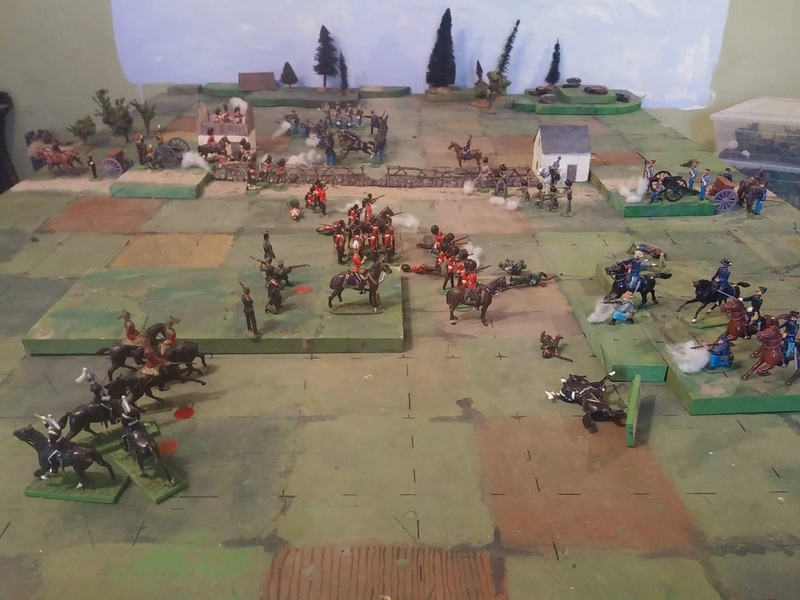 Since my logical mind was having trouble figuring out exactly what my emotional mind was looking for, I decided to try laying out the soldiers and more or less pushing them around to see what developed and let the rules take shape as I went. So far it seems to be working. 5 turns in, this encounter battle is starting to develop nicely. Here's what I have figured out so far. None of it is really new to me but it is a slightly different mix that seems to be developing. B. I want the lowest level of unit to fit in a grid square and I want to keep the 4" grid so my basic 54mm "companies"/"squadrons" will be old Square Brigadier units of 4 infantry or 3 cavalry because that fits regardless of pose. C. I want a hierarchical organization lie the original MacDuff where a group of companies plus a commander forms a larger unit which in turn is formed of a commander plus a number of mid-level units. At this point, 2-4 "companies" plus a Commander form a "Brigade" (battalions of detachments really brigaded in the old sense). D. I miss having subordinate commanders with personalities and want to go back there, even if its just a simple Rash, Bold, Cautious sort of thing. E. I want the player to be in control even if there are situations where things don't happen the way he wanted. So no activation rolls or card activation but commanders who are more than 3 squares away the general will take a control check each turn which might affect what they do. I have kept the turn initiative and chance card deck to shake things up a bit. F. I want manoeuvre to be important so I have lengthened moves and kept ranges short. G. I want the game to operate simultaneously at what are essentially different scales, like Charge! did with its 3 company battalions or The Wargame with 2 battalion Brigades and historical battles refought by a handful or battalions over a battlefield drawn up using a different scale than the rules so that the whole thing works. Well, that's a start anyway and I'm liking the feel that is starting to emerge. Its going to need more than 2 sides of a piece of paper to describe but I expect to be able to play and post more over the weekend. An Hour! An Hour! My Kingdom for an Hour! Napoleonic game at Dave's luxurious venue!